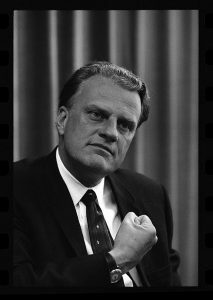 Most of the notices and obituaries of Billy Graham, who died on 21 February 2018, have focused on his significance for Christianity in the United States. Dubbed ‘America’s pastor’ by President George H. W. Bush in 2007, Graham seemed to be the quintessential American preacher – handsome, dapper, eloquent, uncompromising in his presentation of the gospel, and apparently quite untroubled by modern questions about the reliability of the Bible. He was on first-name terms with a string of American presidents from Eisenhower to Obama. He was also a typical product of the Bible belt in the American south. At first he accepted racial segregation, even in Christian meetings, as a fact of life and his relationship with the civil rights movement – notably with Martin Luther King – was at times a fractious one. Yet Graham was also a world Christian leader with a global appeal. His crusades were held in such diverse locations as Seoul, Manila, Rio de Janeiro, and Lagos, as well as in many American and European cities. The Billy Graham Evangelistic Association spun a web of offices around the globe, including cities such as Hong Kong, Tokyo, and Buenos Aires. Graham was also one of the first American evangelists to recruit indigenous evangelists to his team, the most distinguished being the Indian Dr Akbar Abdul-Haqq. Graham’s whole-hearted embrace of the new medium of television for evangelistic purposes blazed a trail that would be followed by others, especially in Africa. It is true that Graham’s presentation of the Christian message remained a typically Western evangelical one in its focus on the substitutionary atonement, but it was universal enough in its appeal to attract vast numbers of hearers from beyond the West – 1.12 million of them, for example, attending the closing service of his Seoul crusade in 1973. Graham had little instinctive sympathy for African theology: coming to Christ, he informed African audiences, must involve a complete repudiation of what he termed ‘tribal religion’. But he was open to learning from Christians from the Global South, even if that was sometimes painful for him. The Lausanne Congress of 1974, which Graham had summoned as a straightforward rallying call to world evangelization, is remembered today more for the robust challenge that the new evangelicals of Latin America led by René Padilla, Orlando Costas, and Samuel Escobar posed to the American assumption that questions of justice were of second-order importance within the mission imperative. The previous year Graham had conducted a crusade in South Africa in which he insisted on non-segregated audiences. His meeting in Durban attracted a crowd of 100,000 from all racial backgrounds: it was the first large mixed-race gathering in South Africa’s history. ‘Apartheid doomed’ was the headline in the Durban Sunday paper. In reality it took another two decades to die, but Graham had added his considerable weight to the gathering momentum among South Africa’s primarily evangelical Christian constituency in opposition to apartheid. Billy Graham was both an American Christian and a global Christian. When speaking in Moscow in 1982 he stated that he had undergone three conversions in his life – to Christ, to racial justice, and to nuclear disarmament. The first of these always remained paramount, and rightly so. But he was humble enough to recognize that some of his early attitudes derived more from his southern-states background than from the Christian faith. He contributed more to the growth of the world Church than perhaps any other single individual. Christians of many different cultural and ecclesial backgrounds have every reason to remember him with thanksgiving. This entry was tagged Africa, American Christianity, Evangelicalism, Korea, Revivalism, World Christianity by Brian Stanley. Bookmark the permalink.